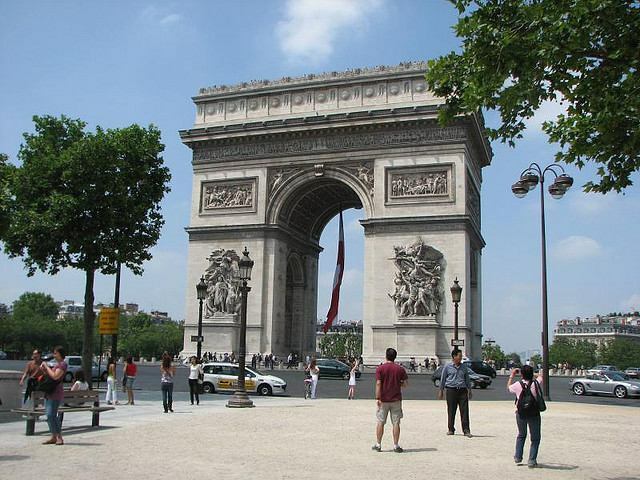 Seeing the Arc de Triomphe (Triumphal Arch) in person is a must if you are visiting Paris for the first time. This huge and impressive historical monument is an example of French patriotism at it's highest. The Arch stands 164 feet high and 148 feet wide. The large opening is 96 feet high and 48 feet across. You can reach the top of Arch by a combination of a lift and steps. There you will find a museum about the Arc de Triomphe and at the very top a viewing area where you can enjoy panoramic views of Paris. 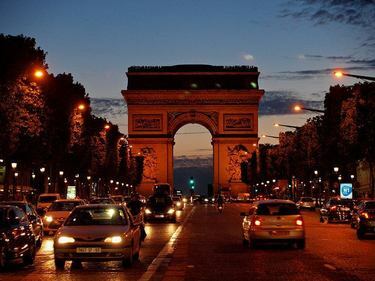 The Arc De Triomphe is located at the west end of the Champs-Élysées in the centre of a large and chaotic traffic circle from which 12 streets radiate. The monument, designed by Jean Chalgrin, was commissioned in 1806 as a tribute to the Grand Army in celebration of Napoleon's victory at Austerlitz during the height of his success. Construction took place over a period of 30 years and eventually, in 1940, the remains of Napoleon passed beneath the Arc enroute to their resting place at Les Invalides. Four significant sculptures on the Arc De Triomphe are Le Départ de 1792', Le Triomphe de 1810, La Résistance de 1814, and La Paix de 1815. There are also six reliefs sculptured in the Arch that epitomize significant events surrounding the French Revolution and the time of Napoleon. These sculptures are incredibly detailed and must be seen to be appreciated. On Armistice Day in 1920 an unknown soldier was interned beneath the Arc de Triomphe in what is now known as the Tomb of the Unknown Soldier. A flame on top of the tomb burns continually in memory of the many fallen soldiers from World War I and II who where never identified. By Metro or RER: Take the Wagram exit from Charles de Gaulle—Étoile station and look for the stairs to the underpass which are located on the north side of Avenue de la Grande Armee right next to the traffic circle. Do not try to walk across the traffic circle - it is far too dangerous.